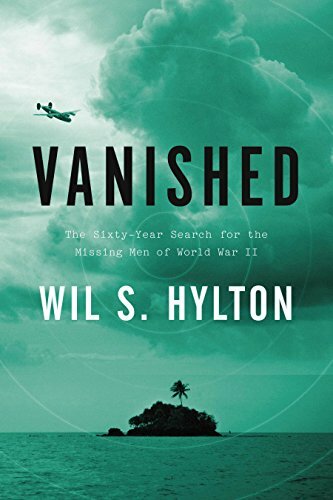 As World War II crawls further back into history, it is books like Vanished: The Sixty-Year Search for the Missing Men of World War II by Wil S. Hylton that bring it surging back into the forefront of our minds. For readers interested in the mysteries of the war, this book will grab them by the scruff of the neck and hold them spellbound from beginning to end. Vanished has all of the criteria needed to engage the reader: mystery, family drama, military battles, startling discoveries, executions, and more. Vanished takes us from 1992 back to 1941 then jostles us through the decade of the 1990s from the South Pacific to Hawaii to Florida to Maryland and all points in between. Hylton documents a search that starts in 1992 and travels backward to 1941 and the beginning of the war, then moves forward through time until 2008 where his journey ends. Author Wil S. Hylton has the gift of exceptional writing. He takes a nonfiction story and turns it into ‘creative nonfiction’ by getting under the skin of his many characters. Although his focus is on Dr. Pat Scannon who searches for men lost during the Pacific Theater of World War II, Hylton skillfully draws the reader into the minds and lives of the men who actually lived and died in that arena as well as their families, descendants, and archaeologists who specialize in uncovering the truths about those who departed decades before. Scannon’s initial goal is to find the resting place(s) of three B-24s that went down near the island of Palau. But as the story unfolds he finds himself drawn into searching for more than just these three planes. The need to provide closure for the remaining relatives creates an itch that Scannon must scratch—an itch that expands his journey to include foraging through mass graves as well as military archives. Scannon’s search for three B-24s is detailed not only through the searches he conducts, but also through the lives of the men who flew the missions of each of these planes. We get to know these men and their most intimate thoughts. We meet the women they fell in love with, encounter the families they left behind, and are let into the deepest feelings they expressed through letters and journals. Early in his search, Scannon found two of the three planes named after their pilots: the Dixon and the Custer. But it took nearly another decade before he solved the mystery of the Arnett. This last plane was draped in layers of obscurity, but Scannon’s drive to learn the fate of the plane and its crew and to bring the “boys home, accounted for his ongoing search. An enormous amount of work is required to open the past and address many unanswered questions. Hylton unravels many threads related to these questions, and by the end of the book he has gracefully rewoven them into a much deeper story with the many details closing gaps that have existed for six decades. It should be noted that there is one drawback to this fine book: no index. This makes Vanished somewhat unusable as a reference unless the researcher uses a whole bunch of yellow sticky tags to mark the important items being researched. That being said, Vanished is a keeper.